I’ve been wanting to cover BitConnect’s bizarre October event in the US for some time. I figure now is as good a time as any, and hopefully at the same time it’ll provide insight into how people get wrapped up in MLM Ponzi schemes. Carlos Matos claims to be from New York and is a BitConnect investor. Last October Matos attended a BitConnect event in the US. 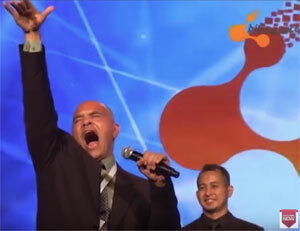 As someone willing to front the Ponzi scheme, Matos was paraded on-stage as an example of a BitConnect success story. Right off the bat, it was pretty obvious Matos was somewhat of a “unique” individual. After enthusiastically greeting fellow BitConnect investors in attendance, Matos goes on to reveal that since June, 2017, he’d generated over $140,000 off a $25,610 initial investment. And let me tell you that I am actually earning around one hund- I mean around one thousand and four hundred dollars on an everyday basis seven days a week. Matos dismisses concern BitConnect is a Ponzi scam, by falling into the trap of “getting paid means it’s not a scam”. He even goes on to deride his wife, who appears to be much more tuned into what due-diligence into an investment should involve. I said “but wait I’m gonna go to the bank, I’m gonna get my bitcoins, I’m going to actually put it into dollars. While Matos’ story of investment into a Ponzi scheme and receiving money isn’t unique, his delivery certainly is – and ultimately makes for some of the most bizarre Ponzi promotion I’ve ever seen. If you’re asking yourself how did people get sucked into BitConnect in the first place, look no further than Matos and the people he convinced to sign up under him. It’s this level of rabid enthusiasm which in itself is harmless but when applied to financial fraud, can be devastating. Even more so when you have business models that dangle the carrot of reinvestment on the prospect of larger returns further down the line (which is pretty much every MLM cryptocurrency offering right now). The above is from thirteen weeks ago, making it extremely unlikely that Jeanne O-Keefe has recovered her “first deposit”. Purportedly earning over a thousand dollars daily by his own admission, depending on how much he re-invested Matos himself might be among BitConnect’s top net-winners. ..Also there are a few interesting images regarding his [alleged] income. 5 BCC says that the folksy breakfast-table story is made up, and his wife is in fact fully on board with the scam and happy with taking money from other people’s accounts. If you’re a decent person who has qualms about stealing others via Ponzi schemes, would you marry a Ponzi scammer? Or maybe I’m being unfair to her – it’s also possible that she’s just a bit thick. And all she knows about her husband is that he’s a fun guy and has lots of money. But that still means the story is made up. If that’s the most bizarre Ponzi marketing event ever there’s plenty of space to raise the bar. It’s basically mere evangelism. You need to talk about how Jebus wants you to be rich to have a hope of winning the Most Bizarre Little Flea crown. If that’s the most bizarre Ponzi marketing event ever there’s plenty of space to raise the bar. It’s basically mere evangelism. You need to talk about how Jebus wants you to be rich to have a hope of winning the Most Bizarre Little Flea crown. Spelling, Oz. You wrote “getting pack means it’s not scam”, when it should have been “getting PAID”. Come on guyss.. I give it 2 thumbs up… DiCaprio would love him in wolf of wallstreet..
Jesus. He’s got to be a “minister” of some kind. Wonder what he’s peddling now? Jeanne O-Keefe already seems to be on to the next one judging from her FB.